Work commenced on the refurbishment of a historic Birmingham city centre building as a new 108-bedroom hotel started to take shape. The first phase of the much-delayed Beorma Quarter scheme in Digbeth will comprise a new Adagio apart-hotel, and an office complex and innovation centre in the former Digbeth Cold Storage building which was designed in 1899 by Ernest Bewlay for the Linde British Refrigeration Company. Completion of this first phase by BAM Construction was scheduled for autumn with the concrete frame due to finished by September. New Street developers went back to the drawing board regarding a railway line footbridge after they admitted defeat over previous plans to clad it. The Navigation Street bridge has been removed from the planning application for the £600 million New Street regeneration project - it was to feature mirrored cladding like the rest of the building. The move was always likely court controversy as Network Rail was accused of cutting corners on the £600 million landmark redevelopment when it revealed it was scrapping the cladding earlier this year. Plans to regenerate Birmingham city centre took a giant leap forward with the launch of the city&apos;s urban regeneration company. 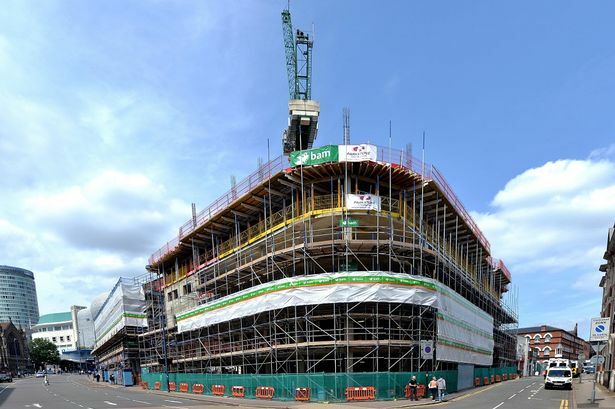 The new company, which was unveiled in July, will lead the redevelopment around Curzon Street where Birmingham&apos;s HS2 terminus would be built, and was set to deliver 14,000 jobs and a boost of up to £1.3 billion to the local economy. It will be the only company of its kind in the city but will follow in the footsteps of other groundbreaking developments, like the London 2012 Olympics and Canary Wharf, which had their own regeneration outfits to drive progress. Work began to regenerate a prominent part of Birmingham city centre after it was held back for years by the economic gloom. Demolition work started on the former Connaught Square development in Digbeth - one of the city&apos;s most long-awaited schemes which sits just 200 yards away from the Bullring. A previous £150 million scheme was first ventured in 2007 but fell foul of the recession and Connaught Square, a vehicle of Irish-based company Naus Group, collapsed in 2010. Calling all wannabe Rory McIlroys... the new £500,000 mini golf course in Birmingham&apos;s Cannon Hill Park opened in July. Leicestershire-based Golden Putter has built a 36-hole golf course in the popular Edgbaston park on land next to the mac arts centre. The new course has a broad range of challenging features including hills, trees and water features such as ponds, streams, bridges and islands - all overlooked by a two-metre waterfall. David Cameron announced a massive programme of investment in Birmingham and the West Midlands including new tram lines and business parks, improvements to city railway stations and new departments at city colleges. One of the aims is to ensure the city has world-class local transport links ready for the opening of the new high speed rail line in 2026, which will have its own dedicated station at Curzon Street, in the Eastside district of the city centre. The £350 million package includes a major expansion of Birmingham&apos;s light rail network. The Midland Metro will be extended with trams running to Edgbaston and Curzon Street. The £500 million Paradise Circus development in Birmingham city centre took another significant step forward with the appointment of an architect to design one its first buildings. Eric Parry in London won a competitive tender against three other practices - Associated Architects in Birmingham and London firms Allford Hall Monaghan Morris and Piercy & Co - to design the building which will replace Central Library overlooking Chamberlain Square. It was the second appointment to the project following the news in March that Birmingham-based Glenn Howells would also design a building. More than 100 swimmers from across the UK took part in a one-off photo event in July aimed at highlighting the plight of one of the Birmingham&apos;s most important community buildings. The 100 Swimmers, a project by photographer Attilio Fiumarella, saw the empty Gala Pool at Moseley Road Baths filled with people. A new breed of buses are set for Birmingham&apos;s streets within two years under a £15 million scheme. The Midlands&apos; first bus-based rapid transit system, featuring vehicles that look and operate like a tram but without tracks or overhead cables, could be running by 2016.